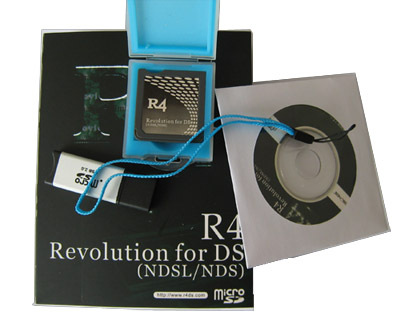 Gamasutra reports that a Welsh store was raided by police who confiscated the owner’s entire stock of Nintendo DS “flash carts”.� Devices such as these (e.g., R4DS) are used to execute any program on Nintendo DS.� Some such popular programs include homebrew software and games, and also pirated commercial software.� The Entertainment & Leisure Software Publishers Association, a UK anti-piracy organization, purchased a quantity from this shop and notified the police upon receipt. The police also claimed all receipts for purchases of this device in the last 2 years. Precrime.� It’s plausible to use these products for exclusively legitimate, legal purposes.� The article doesn’t specify whether the shop owner was charged, but it’s petty and troubling that the police find it necessary to track the people who own these devices. I’m reminded of Sony, a Japanese member of the RIAA.� Sony is a music publisher who manufactures CD burners and blank CDs, and then sues the people who buy all these products. I’m quite dissuaded from supporting the UK with my tourism.� Between all the stories I hear about video cameras and police I just don’t get the feeling anyone is welcome there. I agree with your Sony theory. This post reminds me of the older days. Used to mod xboxes, had quite a few games too. Dreamcast was fun, didn’t even require a chip.